The Plateau International Film Festival, which is scheduled to take place from 24-26 October 2013, will kick off at the National Film Institute, Jos, tomorrow at 9am. There will be film screenings, workshops, seminars, exhibitions etc, and Dul Johnson’s documentary There is Nothing Wrong with My Uncle will screen Thursday at around 11am. Dul Johnson, Head of the English Department at Bingham University, author of the feature film Widows Might and two collections of short stories Shadows and Ashes (a review here) and Why Women Won’t Make it to Heaven (another review here), has recently released a documentary on Tarok burial customs via his production company Topshots Productions. 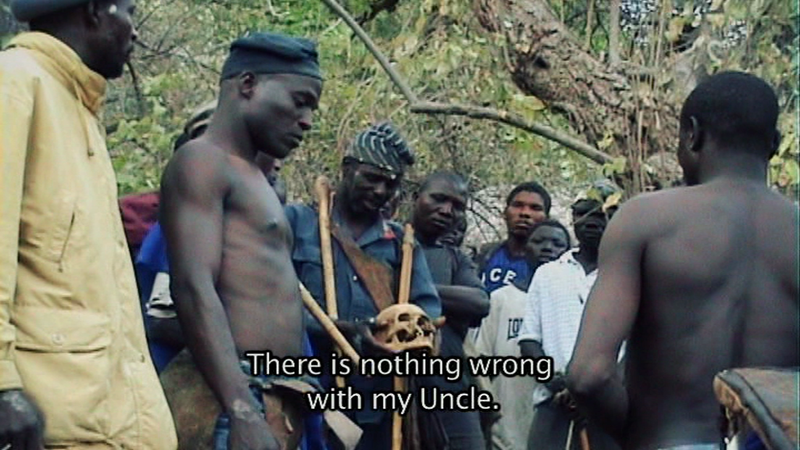 The 62-minute documentary, There is Nothing Wrong with my Uncle, co-produced with French filmmaker Sylvie Bringas, is the kind I like, one that lets characters speak for themselves without any overbearing voiceover. 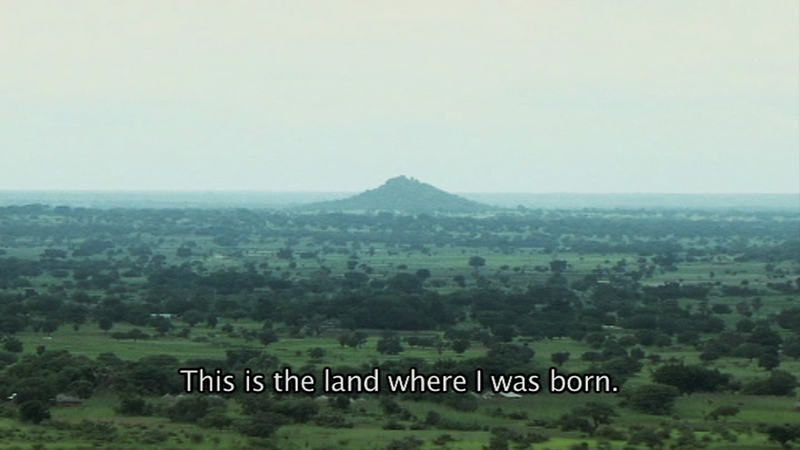 Dul Johnson’s poetic narration in Tarok, with English subtitles, does not explain, it questions. The documentary is about Tarok burial and reburial practices, but it is also a story about the filmmaker’s quest to find his identity between the Christian tradition he has adopted since childhood and the tradition of his Tarok ancestors. 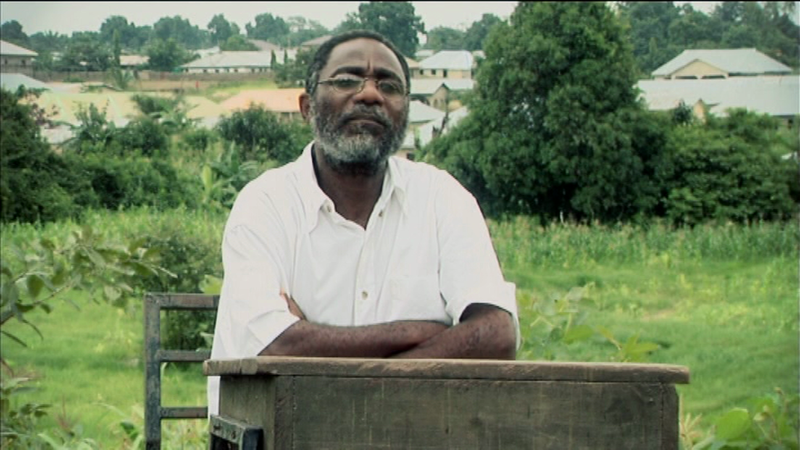 We see Dul at a desk writing in the middle of a green field, driving to Langtang through the breathtaking hills of the Jos Plateau, drinking kunu as he asks questions of a bereaved family or the old man Domshal Nden, to whom the film is dedicated. The film does much to defend and contextualize sometimes misunderstood practices. The Ibyari ceremony, in which the skull of a deceased elder is taken to the mountains to be buried, is performed out of respect. The skull is carefully washed, gently wrapped in white cloth, and placed softly into a clay bowl for burial inside a mound. A chicken and sheep are sacrificed, and the elders pray that the spirit will bless their family left behind. The film is formally quite beautiful. While a few of the hymns inserted whenever Christians pray at the funeral sometimes feels a bit abrupt and distracting—perhaps the intention—the soundtrack of the abwa, dinding, and ntali flute at other moments fit the mood perfectly. The sound, recorded by Alfa Vyapbong and mixed by Philippe Ciompi, is crisp and atmospheric. You can hear footsteps on dry grass, a fly buzzing, voices emerging out of the murmur of the crowd. The cinematography is often quite beautiful. 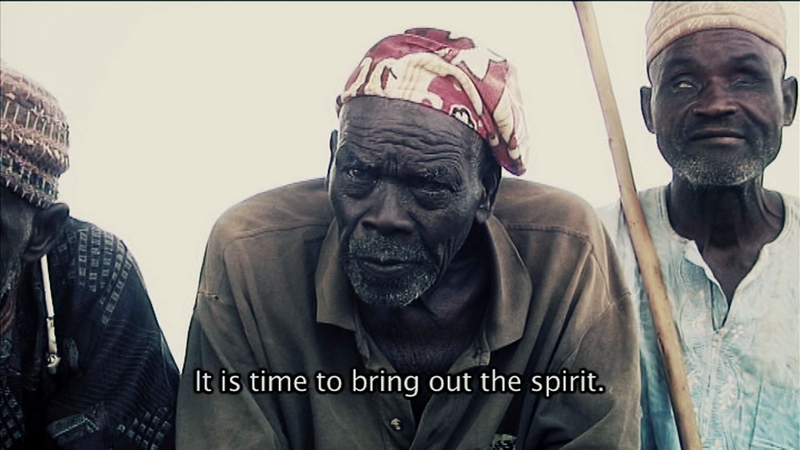 The crisp close-up shots during the interview with the elder Domshal Nden draw out the quiet charisma of this old man. And the landscapes alone make the film worth watching: the road winding through misty purple and green hills, the long shots of neat villages on the plains, round houses with thatched roofs under an old Baobab. Perhaps the only drawback to not having an authoritative voiceover is that the audience is forced to draw connections for themselves, which can sometimes be confusing. The speakers are rarely identified by name. 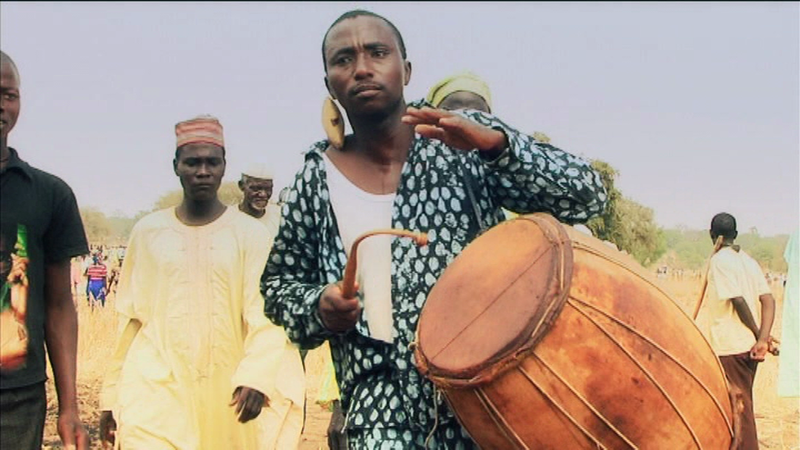 The entire film, including the voiceover, is in Tarok and occasionally Hausa—the English coming through only in the subtitles. However, the language and the poetic subtitles are among the things I like best about the film. Unlike the exoticizing documentaries of the sort made by National Geographic, this film establishes these traditions firmly in a modern present. 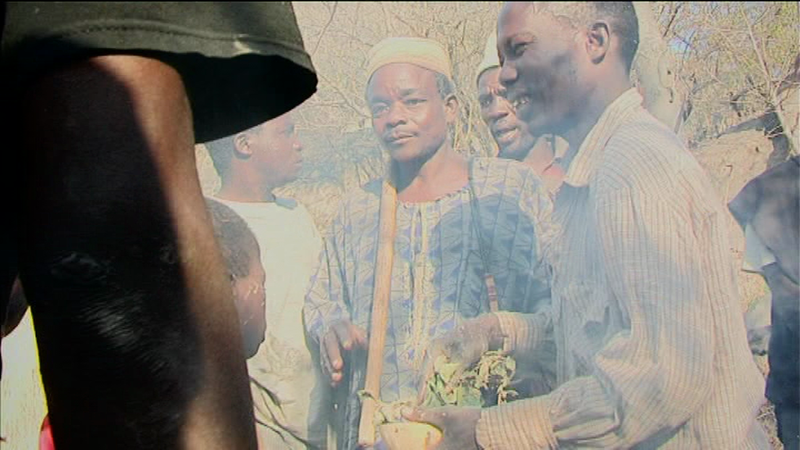 By subtitling even off camera remarks, it allows a non-Tarok audience to hear the jokes and debates surrounding the ceremonies. The reburial of a man’s skull is not a silent mysterious ritual, but more like a family picnic, filled with laugher and a patter of commentary from many different voices. 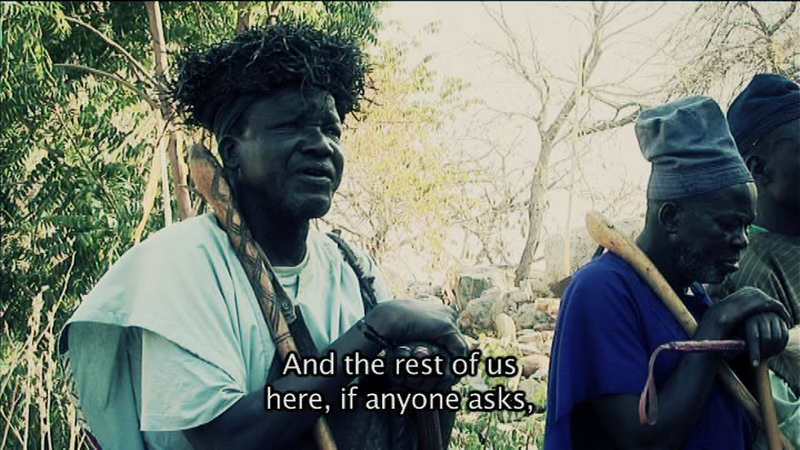 The subtitles also allow us to hear the opinions of the people being filmed about the filmmaker. 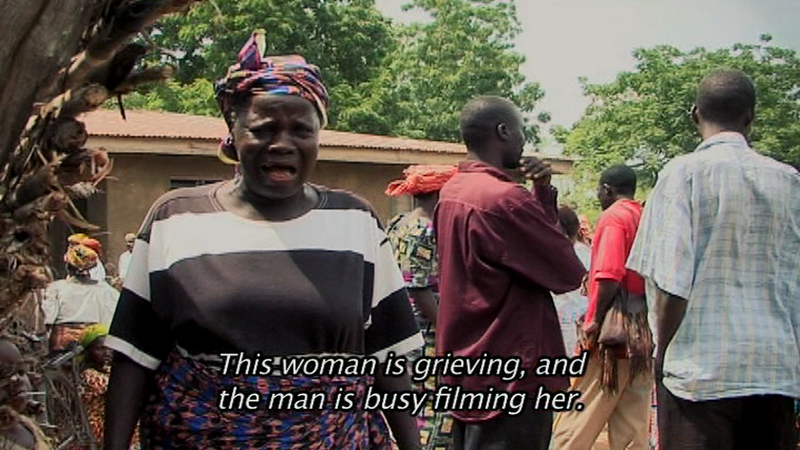 As the camera focuses on the mourning widow, a woman off camera remarks, “This woman is grieving, and the man is busy filming her. Lebong, be quiet so that the man will stop filming you.” Elsewhere, the elder Domshal Nden, when telling about burial customs women are normally not allowed to see, looks around and says with a laugh, “I hope there are no women nearby.” His immediate male audience laughs, but of course, the audience of the film (including me and the editor and co-producer Sylvie Bringas), watching and listening to him through the camera, is made up of women. Elsewhere during the reburial ceremony, an elder complains, “In the olden days, the Elders did their thing alone. It’s the breakdown in our belief system that causes trouble. You said children should be allowed, so that they learn. Isn’t this asking for trouble? Your heart must be mature. Because this is no child’s play. 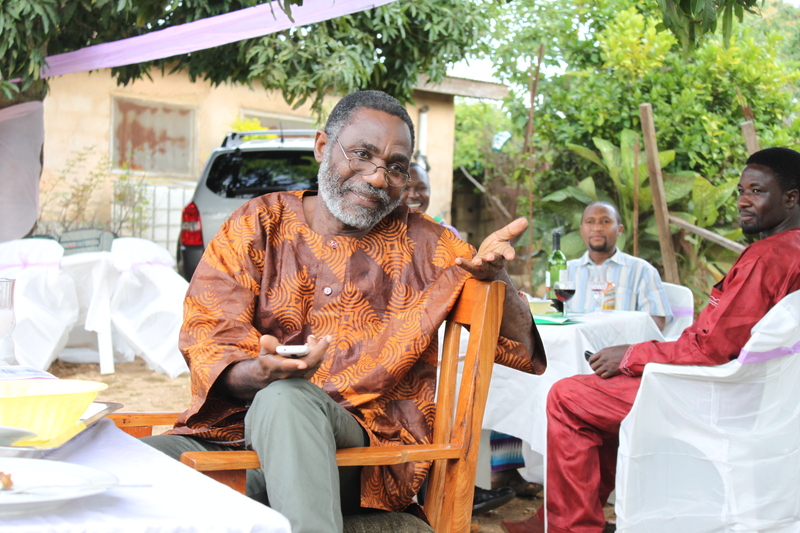 Now our people have broken the beehive, exposed our secrets.” This is a dilemma that has long been faced by those who want to preserve traditions but in capturing them divest them of the secrecy that made them sacred, such as Camara Laye who in his autobiographical novel The Dark Child exposes secret manhood rituals. 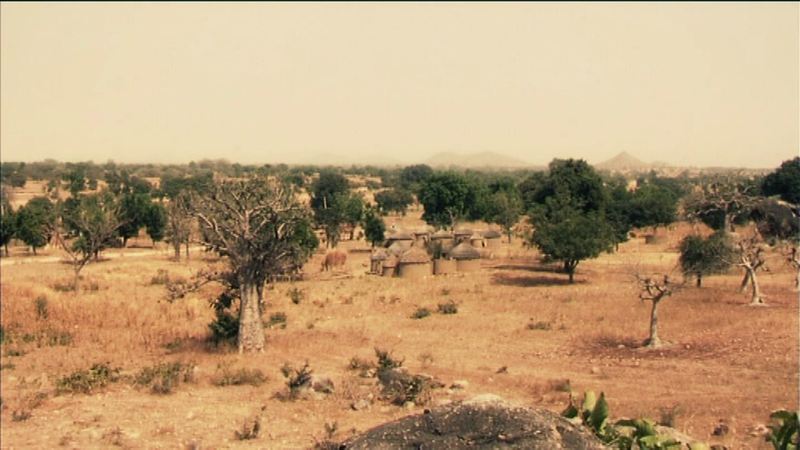 The film is built around several conflicts, conflict between older and younger generations, conflicts between Christianity and Tarok traditional practices, conflicts over which aspects of culture should be open to which people. These conflicts war within the filmmaker himself. When he attends the Ibyari ceremony, he says, “I felt like a total stranger and a great sense of loss”. His discomfort is related to a larger conflict between the old and young generations. 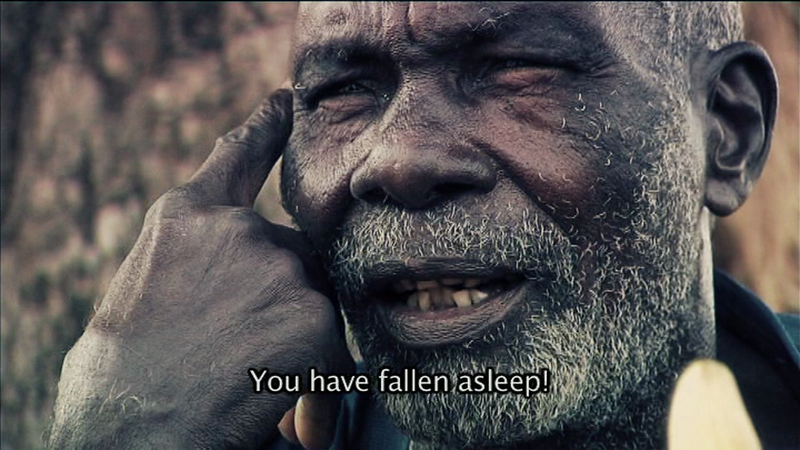 Throughout the film, the elders complain about the inattentiveness of the younger generation. Dul Johnson asks, “I wonder… what will happen to the Traditional man?” Part of the solution he seems to have found is to record it. He asks as many questions as he can on camera. The spiritual leader of the Gbak tells him that a son or nephew performs the Ibyari ceremony, “because he does not want to forget his father’s name.” It is not hidden from women, or small boys, even from Christians. Everybody is welcome to attend. 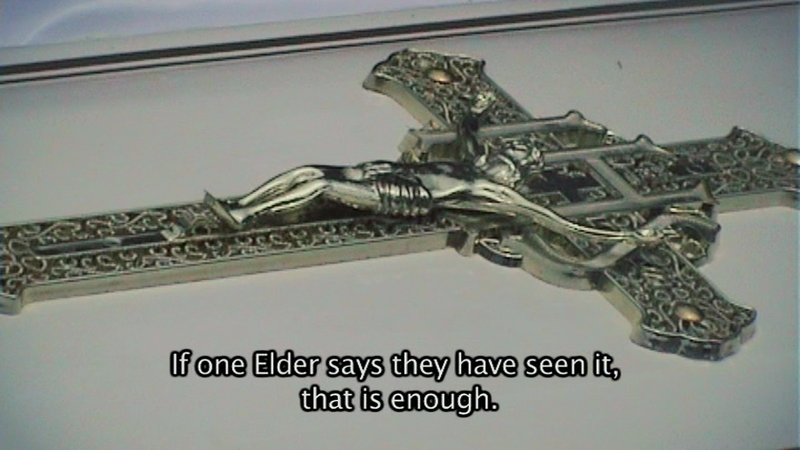 Dul states that his own Christian head will not go to the mountains, but he has found another way to honour his father and his ancestors, another way to remember their names: through a film, which like the Ibyari ceremony, is welcome to all, and a film, which like the ceremony, keeps the memory alive. A dream, a shadow, a prayer, a film. They help us remember. The documentary has previously screened at Brown University and at the 13th RAI International Festival of Ethnographic film in Edinburgh, Scotland. 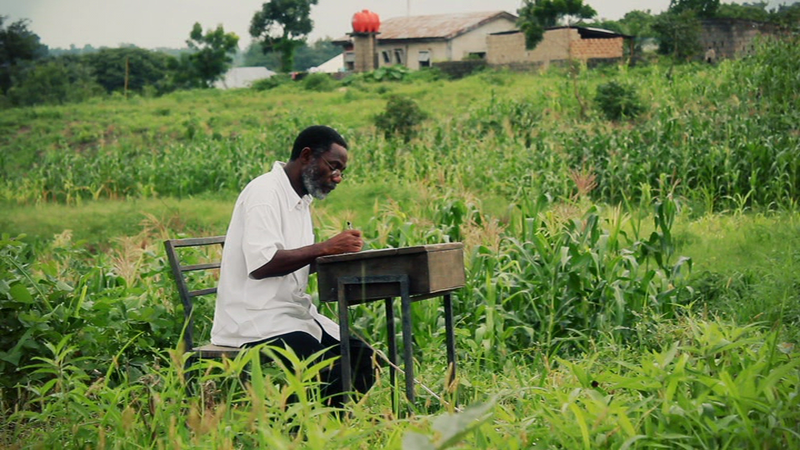 It will be showing at the Plateau International Film Festival in Jos on October 24. 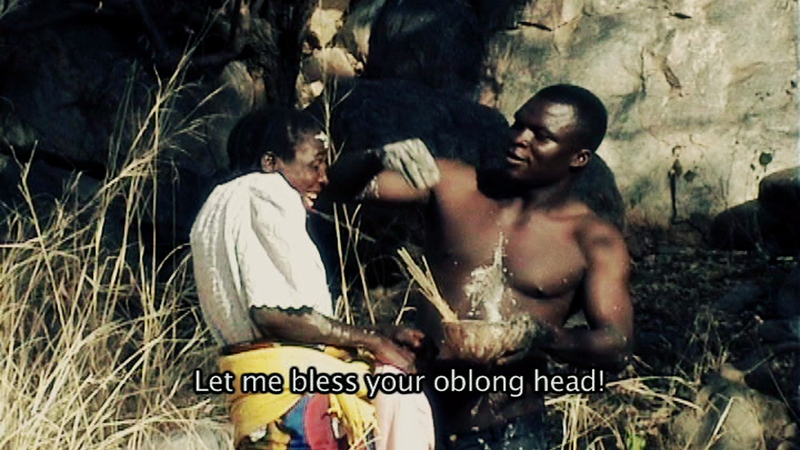 This entry was posted in African cinema and tagged culture, documentary film, Dul Johnson, Jos Plateau, Plateau International Film Festival 2013, Tarok, Tarok burial customs, Tarok people, There is Nothing Wrong With My Uncle. Bookmark the permalink. Some years back when i was in high school, I bumped into these name ”Carmen McCain” and its like i am kind of curious to know her more and after making some research online i was surprised with what i got. I like these page ”A Tunani” cos its kinda unique and amazing that as long as you are Hausa you can not pass it without taking a glimpse of what it really is.